Yunxuan Li 6d has won the American Go Honor Society’s (AGHS) Young Lion’s tournament, for the third year in a row. “The tournament was very competitive,” writes organizer Calvin Sun, “with many new faces appearing this year. The first board topped the Active Games list, attracting almost 100 observers on KGS.” Competing on Nov. 16th and 17th, Li topped a field of 34 players with a 4-0 record. “The tournament was really great” Li told the E-Journal, “it is amazing to see new players each year. I want to thank the AGHS for giving this opportunity to North American youth, to compete and communicate with each other. All the games I played were so difficult. This was probably the most competitive year for the Young Lion’s yet.” Li graciously agreed to provide commentary on his crucial 2nd round match with Jimmy Yang 5d, and the attached game record is a freebie for all E-J readers. “I think it is very beneficial for young people to play go, it helps enlarge our imagination, and develops a sense of logic,” says Li. “It is very cool to have go as a friend when you are young, because it really helps you mature a lot.” 11 players 3 dan and up competed in the Open Section, which Li won. In Division 1, from 2d to 3k, Jeremiah Donley 1k took top honors; Division 2, from 5k to 9k was won by Frederick Bao 5k; Matthew Qiu 16k took the prize in Division 3, from 10k to 21k. Stay tuned for AGHS’ next big tournament, the School Team Tournament, which will be held in March. -Paul Barchilon, E-J Youth Editor. 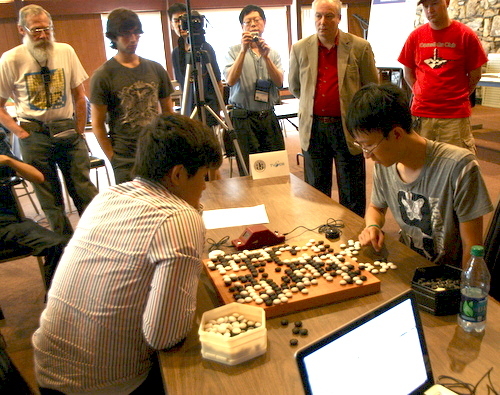 Photo by Wenguang Wu: Li, at left, plays with Fang Tian Feng 8P. 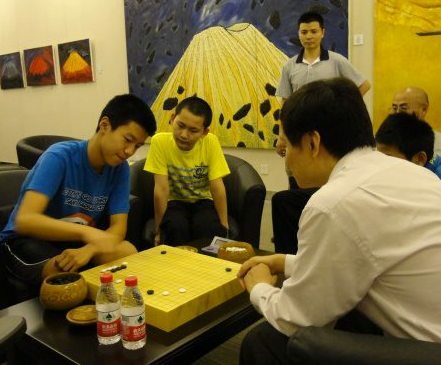 The kid with the yellow shirt, who is watching the game is Ding Hao 6d, an insei from Beijing Ge Yu Hong Dojo. The North American delegation to this year’s SportAccord World Mind Games – coming up December 12-18 in Beijing – includes Daniel Ko and Huiren Yang from the US and Sarah Yu and Yongfei Ge from Canada. The American Go E-Journal will once again team up with Ranka to provide coverage this year, with Michael Redmond 9P and EJ Managing Editor Chris Garlock providing play-by-play game commentary on the SAWMG YouTube channel as well as coverage in the EJ. Here are brief biographical sketches of the players. Sarah Yu 6d is a 23-year-old graduate student in Toronto who’s been playing go for 17 years. 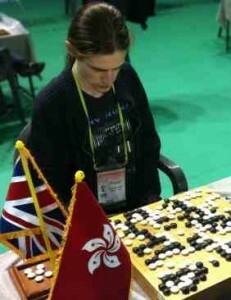 She’s looking forward to “learning go from top professional players” at the SAWMG. Her favorite thing about go is that “The rules are simple, but it’s hard to master.” Her advice to players who want to improve is to “Play each move well, work on the skills, and look at professional games.” Her hobbies include playing table tennis. Daniel Daehyuk Ko 7d, 37, works in accounting and finance in Los Angeles, CA and has been playing go for 32 years. He’s looking forward to “Playing with top professionals and learning from them” at the SAWMG. His favorite thing about go is meeting people and making friends and his advice on how to get stronger is to “Play with someone 2-3 stones stronger and review your games with strong players.” His hobbies include traveling. Yongfei Ge 8d is a 44-year-old software architect in Scarborough, Canada who’s been playing go for 30 years. He’s looking forward to “playing with top pro players” at the SAWMG and his favorite thing about go is “Winning after hard fight.” His advice to improving is to “review games after playing” and hobbies include video games, books and ping pong. Huiren Yang 1P is 60 years old; no further information was available at presstime. A new East Coast Go Center tops the list of projects of the new Iwamoto North America Foundation (INAF), the result of a collaborative agreement with the American Go Association (AGA) approved today by the Nihon Kiin (NK) Board of Directors. The Foundation is named in honor of the late Kaoru Iwamoto and will be funded by the sale of the New York Go Center. “This is a tremendously exciting development in the history of American go,” said AGA president Andy Okun. 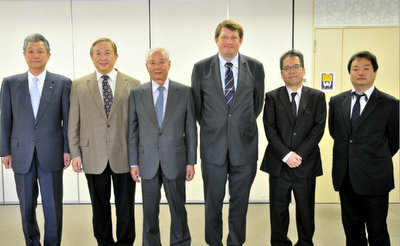 “We look forward to continuing to work closely with the Nihon Kiin to realize Iwamoto sensei’s vision of spreading go worldwide.” The INAF will be an equal partnership between NK and AGA, with each side contributing three Directors, the NK Chairman serving as Foundation President and AGA contributing an Executive Director to take care of the Foundation’s regular operation. “I greatly welcome the arrival of this new Foundation,” said Thomas Hsiang, the AGA’s Vice President for International Affairs, who originated the concept for the Foundation and led the negotiations for its creation. “The Nihon Kiin has always been a great friend to American go and the INAF will add a new, grand chapter to this illustrious history.” A Request for Proposal (RFP) for establishing an East Coast Go Center is expected to be sent to regional go communities in the next few months. Photos: top right: AGA president Andy Okun and NK Chairman Norio Wada signing the INAF Letter of Confirmation in Tokyo on November 5; bottom left: the people involved in negotiating the INAF agreement (l-r): Tadaaki Jagawa (NK VP), Thomas Hsiang (AGA VP-International Affairs), Norio Wada (NK Chairman), Andrew Okun (AGA President), Hiroshi Yamashiro (NK VP), and Shiho Yamada (NK Director in charge of overseas affairs). Photos courtesy Tomotaka Urasoe, NK Overseas Department). Andrew Kay 4d retained the British Championship on Saturday November 23, after concluding a straight 2-0 victory over challenger Andrew Simons 4d in the best-of-three final. Kay first took the title in 2012, after manytime Championship winner Matthew Macfadyen 6d retired. This year the reigning Champion waived his right to bypass the initial qualifying Candidates’ tournament, winning that round to enter the Challengers’ League from which the finalists emerge (see Simons to Challenge Kay for British Championship, EJ 5/27). In the first game of the final, played on November 16, Simons (B) resigned whilst in byo yomi. In the second, Kay (B) – known for his fast and combative play – once again squeezed Simons for time, pushing him into byo yomi with nearly an hour of main time (out of three) left on his own clock. 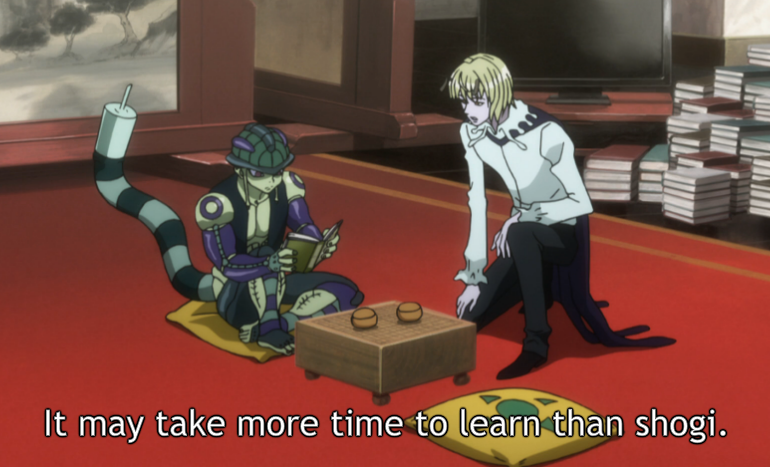 Simons ran out of time in his fourth period of byo yomi. However, comments by referee Tim Hunt suggest Simons probably had about a four-point lead when his flag fell. Kay said of the decisive game, “Andrew Simons gave me a very tough game” and thanked the large number who watched and commented on the game as it was broadcast live on KGS. Click here for the Game 1 record, and here for the Game 2 record; game records contain unmoderated spectator comments. Click here for Guo Juan’s professional audio analysis of Game 2. In other British news, David Lee 3d of Dundee won the separate Scottish Championship for the fourth consecutive year, beating Matt Crosby 3d (Edinburgh) in the final. Four players competed in a knockout on KGS in the final stages. The semi-finalists were Piotr Wisthal 1d (Aberdeen) and Crosby’s initiate, Martha McGill 1k, also of Edinburgh. Report by Tony Collman, British correspondent for the EJ. 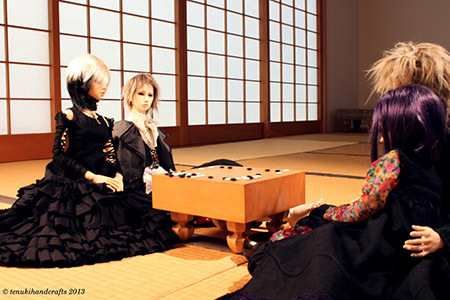 Photo courtesy of Kay’s website. The Seattle Go Center plans to present a gala evening of Pair Go on Saturday, December 7, when there will be a two-round Pair Go tournament featuring a dessert buffet sponsored by Bakery Nouveau of Seattle and prizes for the top teams. The tournament will be played by International Pair Go rules, so participants are encouraged to dress in formal or semi-formal attire. Registration for the tournament will be open between 6p and 6:45p with the first round beginning at 7p. The fee for participants is $5 for annual and lifetime members of the Seattle Go Center, $5 for children under 18 and $10 for non-member adults. Photo and photo styling by Anne Thompson. Sunday is the deadline go-playing university/college students under the age of 30 to register for the qualifying prelim for the 12th World Students Go Oza Championship, which will be held February 24-28, 2014 in Tokyo. Sixteen students from around the world will gather in Japan to decide the world’s number one student player. There will be an online preliminary round on Pandanet to select the 16 student players. Click here for details. University/college students under the age of 30 are eligible to participate. The potentially decisive Game 2 of the British Championship (British Championship to Feature “The Two Andrews” 11/3 EJ) will be broadcast on KGS in the English Room (not the British Room, as previously reported) on Saturday, November 23. Broadcast will start at 10a UCT; look for the game owned by BGAadmin, or from 11a, a clone owned by guojuan with her professional audio commentary and analysis. Kay won the first game, so if he wins tomorrow he retains the title. “In the movie Heathers (1989, at right), in Veronica’s room, before the hanging scene. “I recently spotted go in the anime ‘Bleach’” reports Tyler Keithley. “Unfortunately I haven’t been able to find a screenshot, but it is shown briefly about midway through Episode 258, titled ‘Stray Snake, Tortured Monkey’”. Matthew Clark spotted go in Star Trek: Enterprise. 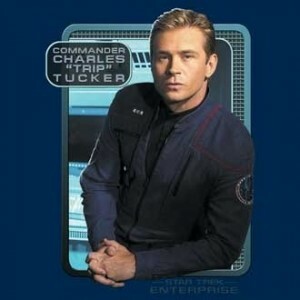 “In Season 2, Episode 22 at 29:45, there is a scene with commander Tucker and an alien he is trying to teach to think for herself,” Clark reports. “After showing the alien the film ‘The Day the Earth Stood Still’, they are playing go on a floor board in the Commander’s quarters. Tucker says that after just one day of instruction, the alien is able to beat him,” which had taken others months to achieve.